6. 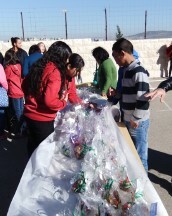 The Handicapped Children Souk: We awoke on Monday the 23rd to find tables with gifts for sale outside the Elementary School. 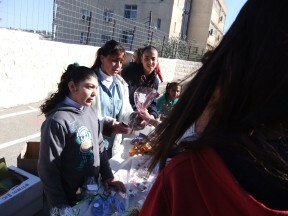 These were hand-crafted items from a school for handicapped children, and some of the children were there selling them. 7. The Big Affair: This was the last day before the Christmas holiday, and it marked the end of the longest term of the year. The students were very happy to go home, but the teachers seemed to be joyous. 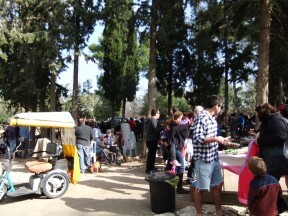 There were parties all over the schools during the breaks, with plenty of food and sweets. 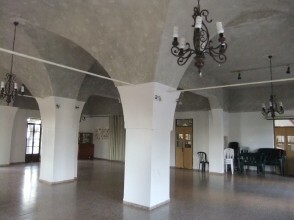 We were encouraged, perhaps invited, to attend some affair at the "Convention Hall" in Ibillin, at which Abuna would be speaking. In the usual way, it sounded mysterious - we thought we knew every street in Ibillin, and there certainly was nothing that resembled a Convention Hall. It was to begin at 8:30, so we ate a sufficient dinner and plotted our time to arrive a little late. That way we could leave if we really didn't belong there. We were told the general direction (go left at the school entry) and we only had to ask directions once. We knocked on a door, and a woman opened an upstairs window. She didn't wait for a question, she just pointed. We followed some others up some stairs, to a door and looked in. There was perhaps the largest room in Ibillin that was not part of the schools. 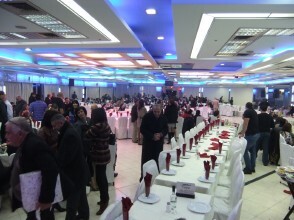 It was set up, as you can see, for a very large and relatively formal dinner party. The tables were generally empty except for one. We were very uneasy and certainly under-dressed, but there at the door was Abuna, or Archbishop Chacour, who greeted us as old friends. We were seated in nearly the last seats at the only inhabited table. 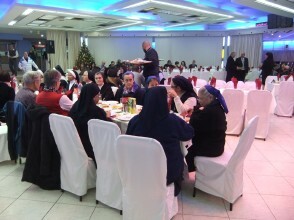 It was truly inhabited - everyone else sitting there was a nun, and all were appropriately clothed. There were two from India, one from Africa, one from Thailand, and the ones across the table were from Italy. Few spoke English. Fortunately for Ruth, Abuna's secretary, Lubna, sat next to her, and Sister Martha from Nazareth was next to Sam so that we could carry on conversations. 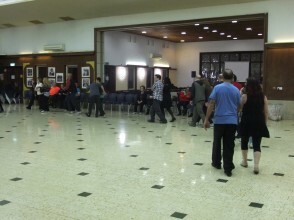 The room filled pretty rapidly with faculty from Melkite schools all over Galilee. At the same time food began to appear at the table. There was plenty of salads, hummus, pita bread, and various other Arab specialties. 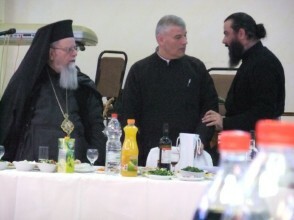 We ate for about a half hour, and then there were various speaches, the most important being Abuna's. After that the music began (it looked like a faculty combo), and several couples began dancing, including the Mar Elias High School Principal, Elias A. G. The music was too loud for conversation. The waiters kept removing dishes and replacing them with new delicacies - I think our plates were cleared three times. When the shish-ka-bob was served we thought that was the main dish, but fifteen minutes later our plates were cleared and replaced with a hearty piece of roast lamb. We left around 11, as some kind of lottery was going on. Quite an evening! 8. 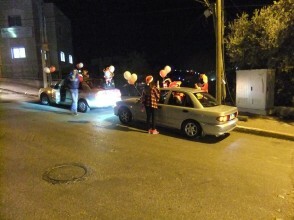 Christmas Eve in Ibillin: The next day was December 24, and we decided to walk out and see how Christmas Eve was celebrated. Perhaps there was a service late in the evening, but at 9 or so all the church gates were locked. All the shops were open, as the pictures below indicate. Most notable were the short parades of cars carrying balloons and lights, with variously clothed Santa Clauses hanging out the windows. They zoomed up streets and down, perhaps in a coordinated fashion since we never saw two parades at the same time. We heard them, however. The principle Christmas Music was Silent Night, Gloria in Excelses Deo, and, at full volume, Jingle Bells. I should find out if the Arabic lyrics refer to a "One horse open sleigh', which would be as unfamiliar to a native of Israel as it is to most Americans. 9. Christmas Afternoon Walk to Shef'amr: Christmas Day was very quiet and at breakfast we exchanged gifts: loaves of fresh bread and navel oranges. It was a very pretty day, so we decided to go out for a walk. We found the main gate locked - at least we thought it was locked, so we left by climbing the fence. We walked to shef'amr, the site of the Christmas Souk. The streets were pretty much deserted, although we came upon an Episcopal Church, just as the Christmas Morning Service was ending. The weather made the day very pleasant. At one point we asked directions of a well-dressed young man who spoke very good English. We told him we were at Mar Elias and he said that was his school. He is a driver and some kind of economics advisor for Egged, the public bus system. We asked him about his life and he was very satisfied. He pointed out his family businesses - two stores nearby - and he felt that his life in Israel was good enough, and the politics did not affect him. 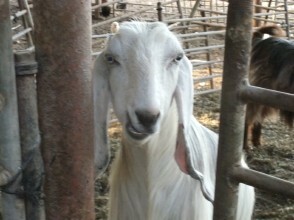 The locked gate was a concern and we even contacted Nawar (perhaps the highest school official in Ibillin) about it. After a long and strange conversation I finally was convinced that the gate was not locked, since the key was lost. It was just that the night watchman was very good at wrapping the chain to look as if it was locked. 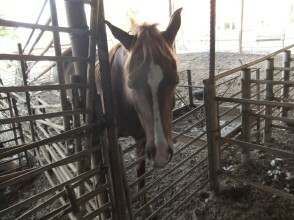 We were worried that on Friday night, when we would be coming in late in a car we would be able to get in the gate. We are afraid that was worked out with inconvenience to someone. This site is a commanding one that looks down on Jewish settlement of Moshav Zippori and reservoirs on one side and the northern hills of Nazareth on the other (the Green Mosque is clearly visible). It may have been inhabited since 700 BCE and survived until the mid 20th century as a prosperous community under many different regimes. What we saw were the archeological discoveries that displayed a vibrant civilization under Roman Rule, that extended from around 100 CE until 600 CE. 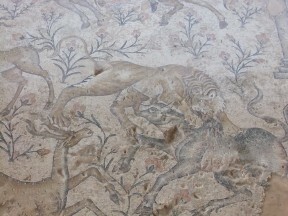 What was most interesting were the well-preseved floor mosaics to be found in community buildings and in a Dioynesian Ritual House. We were able to determine the lay-out of the central part of the ancient city. 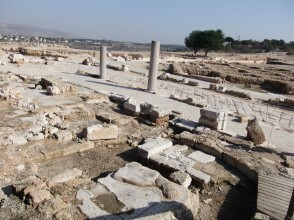 This city did not take part in the Bar Kokba revolts, but remained loyal to Rome. It became a safe place for the Jewish sages, and it is here that the Mishna was written, and it remains the basis of Jewish law and custom today. We also saw the remains of a Crusader Fortess at the highest point of the hill. "...During the Arab revolt (1936 - 1939) and the War of Independence the village and its fortress housed Arab gangs that acted against the local Jewish population. 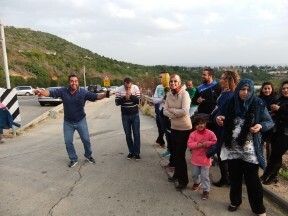 During operation Dekel in the War of Independence on the night of July 15, 1948, Saffuriyeh was conquered and its residents abandoned the place. 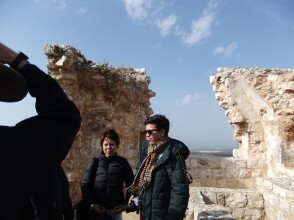 Moshav Zippori was subsequently established adjacent to it." "...Though it lost its centrality and importance as a cultural centre under the Ottomans (1517-1918) and the British Mandate (1918–1948), the village thrived agriculturally. Saffuriyya's pomegranates, olives and wheat were famous throughout the Galilee. 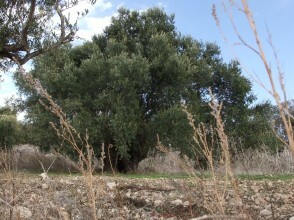 In 1944/45 a total of 21,841 dunums of village land was used for cereals, 5,310 dunums were irrigated or used for orchards, mostly olive trees. By 1948, Saffuriya was the largest village in the Galilee both by land size and population, which was estimated at 4,000 Arabs. 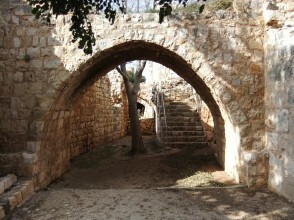 On July 1, 1948, during the 1948 Arab–Israeli War, the village was bombarded by Israeli planes. 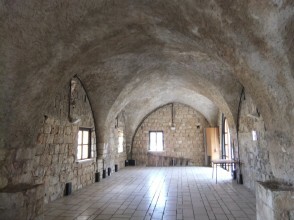 On 16 July it was captured by Israeli forces along with the rest of the lower Galilee in Operation Dekel. The villagers put up some resistance and managed to destroy several armoured cars in an ambush. Following the collapse of the resistance all but 80 of the villagers fled. Some made their way northwards toward Lebanon, finally settling in the refugee camps of Ein al-Hilwa, Sabra and Shatila in Lebanon. Others fled south to Nazareth and the surrounding countryside. After the attack, the villagers returned but were evicted again in September 1948. On January 7, 1949, 14 residents were deported and the remaining 550 were resettled in neighboring Arab villages such as 'Illut. 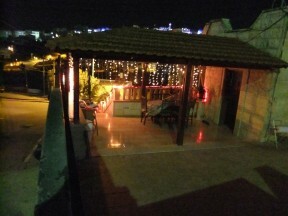 Many settled in Nazareth in a quarter now known as the al-Safafira quarter because of the large number of Saffuriyya natives living there. As the Israeli government considers them absentees, they cannot go back to their old homes and have no legal recourse to recover them. " I am struck by the use of the word "abandoned" in the first account. 2. 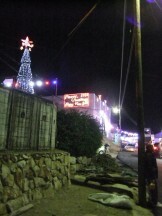 The photos above and below are of an anachronistic village called Bethlehem of Galil. It was first settled in 1906 by German Templars who wanted to establish a colony close to Jesus' native land. They successfully farmed the area, but because of their loyalty to Nazi Germany they were eventually evicted with many being sent to Australia. 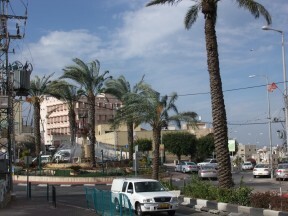 In 1948 the few remaining inhabitants were displaced by Jewish Israelis. All that remains of the original inhabitants is some interesting South German architecture, some old farm implements. 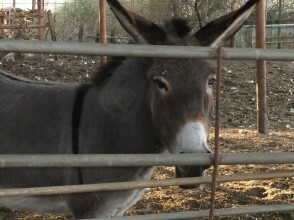 Ruth found the livestock below in a large covered pen. They seemed to be very lonely. 3. We had been looking for folk dancing, and David, Yona and Sarah found us some. 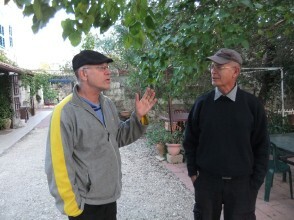 We arrived at the Gennegar Kibbutz for a monthly gathering. 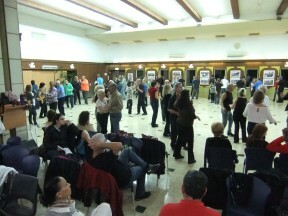 We found a large room with a few dancers doing Israeli line and circle dances to music organized by a one-man DJ and teacher. He already had a set program of dances laid out, and he played about two minutes of each before moving immediately to the next. Everyone else knew all of them, including the men. The crowd of dancers grew to well over 100 roughly equal in men and women. The dancing continued non-stop from five until around seven (that's about 60 dances). 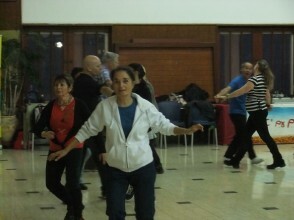 We did our best - the rhythms were sensible and the steps repetitive but the patterns were usually too long to be learned in one pass. I have never done or seen done so many spins in one evening. The first two hours of dancing were followed by some kind of program of singing and recognition speaches honoring individuals for a years' work of organizing, etc. There were a couple of prayers, so that took care of Sabbat. There also were three accordions among the musicians, which kept Sam interested. Next came a strange pot luck dinner. There was a 12x25 foot room with food on tables along the outside of the long dimension. There was a scarcity of serving utensils. We walked in and got in line - but there was no line. There were plastic plates and forks at the other end of the room, and in between there were diners camped out in front of their favorite dishes, filling, emptying and refilling their plates, Everyone seemed to be in a hurry, because the ballroom dancing was about to begin - one each of Tango, Fox Trot, Paso Doble, Swing, and Viennese Waltz. The pictures below are from that portion of the dance. We managed to get to the food late, and only had one waltz together. After the ballroom part there were more Israeli line dances, some couple dances, and at our request the Salty Dog Rag and a Hambo. We left at around 10 pm. That's another 60 dances after the break, and there was no sign of letting up. 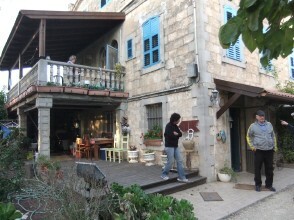 We returned to the guest house for the night; the gate was closed but Alla was there to open it. I think he was waiting for us, to make sure that we got to the guest house safely. We ate breakfast together in Badiya's kitchen - a warm and convenient spot. Badiya arrived while we were there, and we hope that she did not feel that we were trespassing. 4. 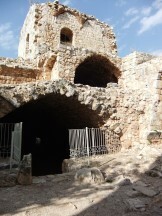 Yehiam: This is a partially restored Crusader Castle and fortress. A kibbutz was established at this site in 1946, but the inhabitants were beseiged at the beginning of the 1948 war by poorly trained and equipped Arab forces. In the original UN partition this was Arab rather than Israeli land, but the Jewish Kibbutzniks refused to leave. Despite some hard times, the better armed and trained Israeli forces prevailed and this land along with Galilee became part of Israel. We were shown this story in an obviously fabricated movie. It reminded me of a lot of things we saw in the Soviet Union. 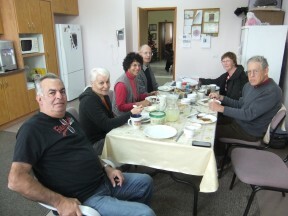 Our half day in Yehiam was very pleasant, We made many acquaitances, including a Swiss family with connections to the Phillipines, and a Nigerian resident who had married one of the Kibbutz members. This happened to be some kind of special day - perhaps the something to do with the establishment of the Kibbutz. We ate our lunch on the fringe of a large picnic which seemed to involve most of the local residents. 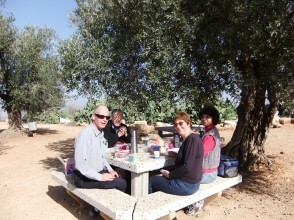 We then traveled to Nahariya and had a cup of tea with Aviva in her small but efficient Kibbutz house. 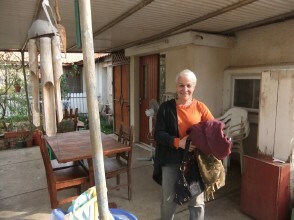 Her Kibbutz is primarily agricultural growing large amounts of bananas, It also has improved its resources by allowing Nahariya commuters to build houses on Kibbutz land (I think that's the way it works) The new houses are much larger than the old ones. 5. 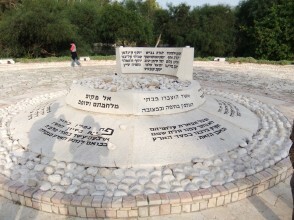 The Bridge Destroyers Memorial - This is a memorial containing the remains of 14 Palmach members who died when the explosives they were carrying exploded prematurely. The sign we read says that the bridge was destroyed - yet we walked across it. Since Israel eventually freed itself from the British occupation, they were freedom fighters. 6. Our last stop of a very busy two days was at Rosh Hanikra, a chalk rock formation on the sea exactly at the Lebanese border. 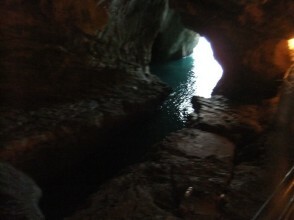 The action of the sea has eaten into the soft rock over the centuries, and there are caves and grottoes under the rock that sometimes extend 200 meters inland. 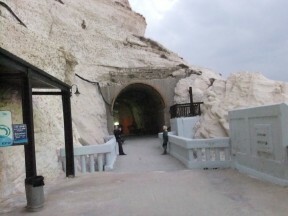 It also is a serious security point, with radars and army forces high on the rocks. Along the coast to Nahariya there are regular army patrols and in the sea several permanently stationed patrol boats. As we (six of us) arrived someone, maybe Ruth, did a little dance step, and we turned to see a man in a family group dancing and encouraging her to join him. We walked down to meet them, David leading the way, and had a good time talking. They appeared to be Muslim, and came from Tamra - the town we can see on the hillside beyond Ibillin. 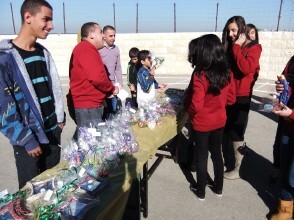 They were well aware of the Mar Elias schools, since many students come from Tamra. I suspect that they invited us to visit them some time. 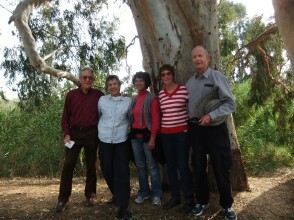 At this point David, Yona and Sarah left for Rehovot, hoping to beat the traffic south. It seems strange that most of Israel likes to travel on Saturday, but the very efficient public transportion system is completely closed down. As a result the homeward traffic jams on the Sabbath can be dense. 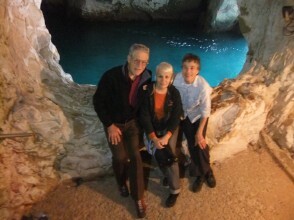 We were certainly grateful for the two days of exploring with them, and the good company. We did have some differences of opinion when we discussed political issues with David, but that never interfered with our friendship. 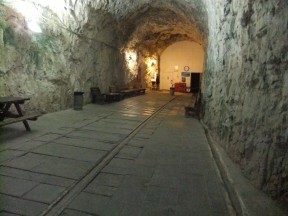 Aviva took us down a cable car to sea level, and after a movie about the rocks we walked through deep caves excavated by the flow of the sea. 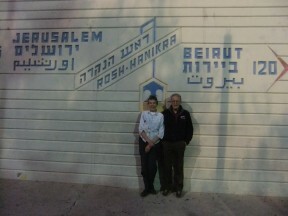 We walked as far as we could toward Lebanon, just a few meters away on the other side. She took us home through a late-Sabbath traffic jam in Akko, after we tried to find a post-Sabbath bus. We slept very well.